The story begins with an architect and yoga teacher named Peter Sterios, who had a realization one day that the mats he and his fellow yogis using were not conducive to the practice of yoga. This was nearly two decades ago, when yoga was far from the mainstream. A common practice then was simply to have a roll of PVC in the back of a yoga studio from which students could cut a piece to practice on. Material quality varied, but was almost invariabley poor. Sterios, with a penchant for design, took the same material and greatly compressed it. He made a dense, thick black mat that possessed unrelenting grip and cushion. He then sent prototypes out to some yoga friends, among them early popularizers such as Rodney Yee and Shiva Rea, and the mat was rapidly embraced by yoga teachers around the country. And so in 1997, Sterios invested his life savings to create one container full of these thick black mats and formed a company, which he named Manduka — Sanskrit for frog — in honor of his own yoga teacher, a Hungarian named Shandor Remete. Word of Manduka spread. Like so many great design ideas, it appeared obvious, but only in retrospect, after the mat had been created. The company’s signature “Black Mat” was nicknamed the “Taj Mahal” of yoga mats. Within the quickly burgeoning world of yoga — according to a 2012 study, well over 20 milliion Americans, or 8 percent of the population, now practice yoga — Manduka became a revered brand. “Thick, heavy and graphite-gray , the Manduka mat is a status symbol in itself,” the New York Times reported in 2012. That same study, conducted by Yoga Journal, estimated that $27 billion was being spent annually on yoga in the U.S., an 87 percent increase since 2007, while those who practiced yoga increased in numbers by 29 percent. Industry revenue was projected to keep increasing nearly 5 percent a year. 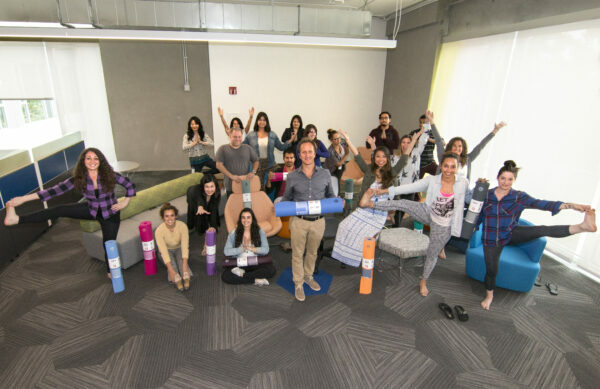 Manduka, privately held and based in El Segundo since 2009, this year will see revenues of $40 million, Melzter said, and is expected to continue the 30 percent annual growth the company has experienced for several years now. He said El Segundo has a been a perfect place for fostering the company’s growth, in part because the access to creative talent is great in the Beach Cities, as well as the fact that nearby light rail allows many of its 60 employees to commute easily. Manduka’s mats are still considered elite, and as the industry itself has expanded, so has Manduka’s product line — to include a broad array of often lower cost mats that include travel mats, “eKo” mats made out of sustainably harvested tree rubber, and 100 percent recyclable “LiveOn” mats. But the Black Mat, which costs around $100, often double its competetion, still carries a certain mystique about it. With its lifetime guarentee and a feel that is often described as “luxuriant,” the mat remains the core of the company’s business and representative of its ethos. Other mat brands have proliferated, but there is no mat with which yogis form a deeper attachment than Manduka’s signature model. Suzy Nece, owner of Yoga Loft in Manhattan Beach and one of the top yoga teachers in the South Bay, said given the amount and quality of the time yogis spend on their mats, the importance they place on a well-made yoga mat is natural. She’s used a Manduka mat for nearly 14 years. How something so simple as a 71 or 85 inch roll of PVC has achieved such high regard among a few million people is indicative of how and why yoga itself has so quickly taken root in American culture. “A mat becomes a symbol for personal transformation,” Meltzer said. Meltzer experience such transformation himself through yoga. Meltzer, who was first introduced to the company through the Black Mat, still recalls the first time he practiced on it. Which ultimately is exactly what Manduka’s mission is: to make the experience better, and thus bring more people to yoga. Manduka is holding its summer sample sale, featuring discounted yoga gear from past and recent collections, June 20 from 10 a.m. to 5 p.m. at Manduka Headquarters, 345 S. Douglas Street, El Segundo. For more information, see Manduka.com.